A long-blooming fall plant combo encourages you to enjoy the last bits of the garden before winter. 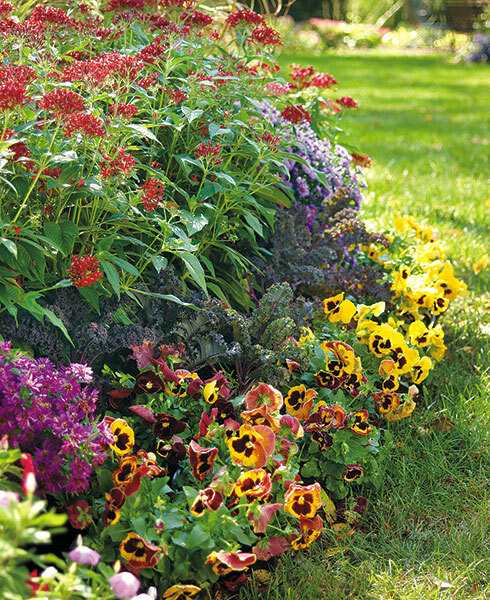 These plants will give your beds and borders a look that lasts late into the season. When nights begin to cool, but days are still warm and sunny, you’ll notice fall colors emerging one by one. Then all at once a crescendo of fiery hues — red, gold and orange — light up the surroundings. When you’re designing your landscape or choosing plants during spring and summer, look for ones that also have vibrant fall color. Annual plants planted in the spring are usually still blooming come fall. Fertilizing every two weeks with a bloom-boosting formula, such as 15-30-15, will help plants like these starflowers do just that. In the fall, starflowers aren’t as cold-tolerant as the other plants used in this combo, so protect them with a sheet if the temperature is expected to go below freezing. When the season comes, search the garden center for cool-season plants, like the pansies and kale here, that are easy to pop into the border. They may or may not be hardy through the winter, so it’s best just to think of them as annuals. But there’s no harm in leaving them planted to see if they regrow the following spring. ‘Redbor’ kale is a great cool-season plant in the veggie garden or flower bed. Its purple-green curly leaves are a nice contrast to yellow pansies, and it’s edible — remove a few outer leaves to add to a tasty autumn soup. Plant this combo in a full sun to part shade location to keep the plants growing their best. Look below to learn which plant is which!